Maroon Bells is a piece of Crested Butte history that you don't want to miss. Owned by the same family for over 30 years, this late 1800's cabin is rooted deep in the history books of Crested Butte. Through the years it even found time to be a bicycle repair shop! Lovingly restored and back to it's splendor as a fantastic family home, the location can't be beat! Right in the middle of the historic district and only 1 block from Elk Avenue, this 4 bedroom, 4 bath home with private HOT TUB is sure to be your family's base for many memorable Crested Butte vacations! Step inside this spacious home and discover the definition of 'comfort.' With fantastic beds, a huge sunken HOT TUB, and a large yard, there is plenty of room for the whole family, (10 to be exact). The open living, kitchen, and dining area assure that everyone is a part of the action while that heated game of 'go fish' is being played out on the large dining room table. On the first level you will also find the master bedroom with king bed and private master bath. There is a queen bedroom on this level along with two full baths and a laundry room. Upstairs you will find two separate bedrooms. The one on the front part of the home has a queen bed and two twins. The second master suite is on the back of the house and has a queen bed, private bath, and it's own outdoor deck. This room boasts the most incredible views in the house of the surrounding mountains to the North of Crested Butte. Outside you will find a large yard and a private covered hot tub to relax after a long day skiing, hiking, or just shopping! Whatever your activity or season in Crested Butte, load up the family and friends, and enjoy the comfort of Maroon Bells! Easy level entry with main floor bedroom(s) and full bath(s). Please inquire about limitations. A great house for our 2 families! Comfortable and super convenient to everything we wanted to do. We had a wonderful time hanging out in the house and exploring beautiful CB! Great place to stay in CB! House is in a great location close to all the restaurants and bars. We had everything we needed for our stay. The house has plenty of beds for larger groups/families and a hot tub to soak away those sore muscles! All was really wonderful except the contact person was very unfriendly, that's a first for Crested Butte. The house was open for an early check in, but she told us we could not check in. With temperatures in sub zero (worried about wine freezing an exploding in -10 degrees), we landed with a 5 hour wait to check into the house. She never offered to place luggage in the hallway of the house and when asked very politely if it was possible, she said no! We drove by the place twice to see if the maids would care and it was completely cleaned and ready to go. We could have checked in at any time once arrived. Poor customer service and attitude for such a nice little town. We are glad you enjoyed the home and apologize that we weren’t able to accommodate an early check in. I show where we spoke with you two days prior to arrival and sent a follow up email as well letting you know we had maintenance to perform on the home and that it would not be ready before your scheduled 4 pm check in. Unfortunately there was no place on the property to place your luggage with the maintenance we had scheduled and despite appearances the home was not ready to go. With the tight holiday cleaning and maintenance schedules we do our best to make sure every home is perfect for our guests. We hope to have you stay with us again and will certainly try to accommodate early check ins when possible. Safe travels! Thoroughly enjoyed our stay at Maroon Bells. The house was comfortable and close to all the wonderful restaurants and shops that Crested Butte offers. The backyard was a plus and the hot tub was wonderful !! It would have been nice to have chairs on the upstairs deck. Thank you so much for the wonderful review and we are glad you enjoyed your vacation at Maroon Bells! Thank you for your suggestion on the chairs. We will certainly add some for next summer so that everyone can enjoy the upstairs deck. We look forward to having you stay with us again! Safe travels! We couldn't have asked for a better spot. It was just the four of us so we had lots of room to spread out. I wouldn't hesitate to come back with a group twice as big. The location, the cleanliness, and the amenities were perfect for our three days. We usually like to try new places but we will strongly consider renting this same place again. The house is in a great location to walk anywhere on Elk AVenue. It was very clean and comfortable. WE had a great trip to Crested Butte. 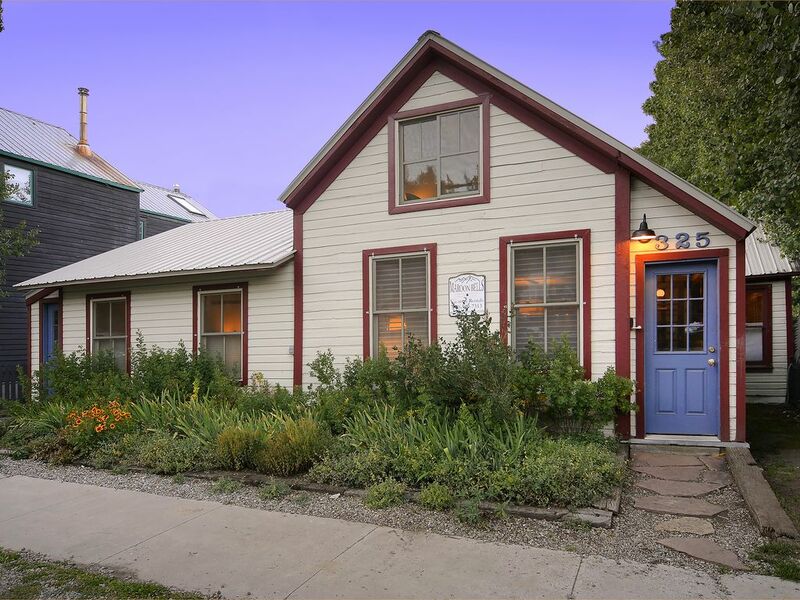 This home is located in the historical town of Crested Butte, Colorado. The town is located within the Gunnison National Forest and has access to almost 2 million acres of outdoor activities creating endless opportunity for fun. It is near Mt. Crested Butte Ski Resort and Taylor Resorvoir. Plenty of hiking and mountain bike trails. Cleaning & Amenities Fee: This fee includes your departure cleaning, as well as, a home fully stocked with Gilchrist & Soames bath products, laundry and dish soaps, paper products, and trash bags. For homes with wood burning fireplaces or fire pits, wood and fire starters are provided. Homes with propane or charcoal grills are supplied with their respective fire source. Should any items run out during your stay, an Iron Horse team member will replenish the home as quickly as possible after being notified. Also included, is access to our complimentary concierge service and 24 hour on call maintenance for emergencies. Travel insurance can be added to your reservation for 6.95% of the total reservation. Rates are subject to change prior to a confirmed reservations.